Home Outside Football Chelsea Transfer Rumors: Willian All Set To Join Barcelona? 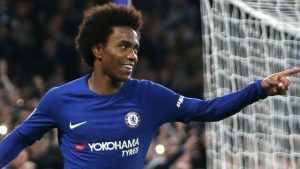 Chelsea Transfer Rumors: Willian All Set To Join Barcelona? Post the World Cup 2018, the transfer window reopened. And, international football clubs began their search for new prospects for their upcoming seasons. One such player whose transfer talks have been in the media for quite some time is the Brazilian winger, Willian. Willian Borges da Silva, who is popularly known as Willian is a professional footballer and currently represents the English club Chelsea. Reportedly, Barcelona has shown interest in the player and have already made a bid worth £55 million, for the Chelsea star. Willian dey go Barcelona, Hazard and Courtois dey go Real Madrid, Kante dey go PSG, Chelsea wan buy Joe Hart. Willian’s playmaking skills, is one of the biggest reasons as to why Barca have shown a keen interest in the player. Despite being 29 years of age, the Chelsea star commits to his defensive duties and mostly restores the ball possession. This alone makes him a valuable asset to Barcelona. Moreover, Barca have the 2nd highest number of foreign players from Brazil. Two of the recent additions being of Phillipe Coutinho and Arthur. This means that if the Camp Nou signs Willian, then they can benefit from the chemistry between Coutinho and Willian. Moreover, the Chelsea winger will prove to be a fine addition to the striking pair of Luis Suarez and Lionel Messi who are already in red hot form. Will the Chelsea Winger Join Barcelona? To find out the answer to this question, move on to the next page.